Dennaton Games has posted a coded message to its social media pages, leaving few clues to its solution or contents. Hotline Miami is a pretty nutty game. The bulk of the experience puts you in the shoes of a nameless murderer fighting his way through a series of increasingly violent and bloody hits on the criminal underworld. His mental state throughout the proceedings is generally on the tweaked side of things and degrades further and further as the game progresses. All in all, it's a fairly cryptic game, giving out only small snippets of the story up until the very end. Its enigmatic nature in mind, there's little surprise that a potential announcement from the title's developer, Dennaton Games, would feed players a potential update in a similarly mysterious fashion. The indie studio posted an unexplained string of letters to its Twitter channel yesterday. The contents of the Tweet are as follows: "LSSRUTB UYO SEEL LNLS ERED LEH"
Many have assumed that the seemingly random letters are actually a coded message. This assumption isn't without merit. 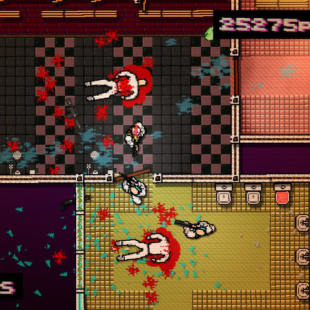 Hotline Miami had collectible letters forming a code players could use to access bonus levels and extra story content. A coded announcement, perhaps about the game's already confirmed sequel, would be a neat reference to the original game. Whether or not this is, in fact, a code it has many fans of the original game riled up and working hard to crack it. It's worth mentioning that there's no actual proof that this is really any sort of code. While we're going to give Dennaton the benefit of the doubt and assume it wouldn't mess with people on such a scale, there's always the possibility that a rogue cat took a stroll across the keyboard while its owner was busy making Pop Tarts. Granted, said feline would need have had the wherewithal to capitalize, push the space bar and avoid all numbers and punctuation symbols, but it's not outside of the realm of possibility.